Sherlock Holmes: Mystery of the Mummy is an adventure game replete with puzzles, many of them timed, which takes place in its entirety in a privately owned Egyptian museum. The museum also serves as the impressive residence of Lord Montcalfe, a student of the antiquities, who has seemingly passed his passion for archeology, as well as other traits, on to his loving daughter Elisabeth. But, alas, Lord Montcalfe has come up missing and his adoring daughter has thoughtfully engaged Sherlock, her distant cousin, to find her missing father. You, as Sherlock, become a part of the unfolding mystery solo, sans Watson, as you enter the museum in search of the missing Lord. Be aware that puzzle content and frequency becomes increasingly more difficult as you progress in the game. Good luck, Sherlock! Walk around the hall and examine the sarcophagi and take note of the later of the two dates shown under each one. When you have collected the dates above, go to the front door and you'll see a lion statue on each side. Go to the left side and click on the statue. A secret compartment will open it the wall. You're right, its your first puzzle. Very straight forward stuff here. Just enter the dates in the right location and click the diamond shaped button on the right. A panel under the staircase will open. Go over and pick up the KEY. Go around to the other side of the stairs and pick up an Anubis SEAL from the potted plant. Turn around and use the key on the locked doors behind you. Enter the room. Go left and pick up a second SEAL behind the seated statue at the far left of the room. Turn around and approach the mummy case, room center. Look down. Open the tool box and extract the tools. You should retrieve an OIL FLASK, a HAMMER WITH LEVER, and a SCREWDRIVER. Turn and look up to examine the Khaepaseth mummy. Look at the wall mounted display of the curse of the mummy. Turn around and check out the glass display case. The documents are "illegible." Note the scraps and papers thrown everywhere. Someone has ransacked the place? Go to the door at the end of the room, right of the display case. Turn right and pick up the gold TIE PIN under the blue topped foot stool. Swing back left and enter the next room. Go forward/right once, toward the black Anubis sculpture. Pick up the third SEAL on the floor to the left. Swing slightly left and examine the sacrificial knife on the lower shelf of the cabinet. (You might want to remember just where it is for later reference.) Pan around to room center and look at the large black statue of Amenophis. Go forward once to the end of the room. There's a double door to your left and one ahead of you. Examine the pictures on the way between the doors and pick up the PHOTO OF ELISABETH MONTCALFE. Click on the picture. Click on the enlarged picture. (If you lose track of it, its gone into your "letters" inventory as will many other documents to come. The left and right arrows allow you to page through the documents you collect. Scan through your letter file often to refresh your memory and gain hints to the progression of the story. ) The letter urges your caution as the mansion is said to be "full of traps!" Look down on the floor in front of the door to the right and in front of you. Pick up the PIECE OF BANDAGE. Cross the room and examine the glass mummy case on the opposite side of the room. Return to the double doors at the back and side (by the pictures) of the room and check out the symbols. Looks like maybe you'll need four of those seals before you can get through those doors. The other door is locked and you've yet to find the key. So, return through this room and go out through the opposite door. Pass through the room. The door to the stairs is on your left. Open the door at the end to see another exhibit area. Go left to examine the excerpt from "The Book of the Dead" in the glass display case. Examine the burial urns on the chest to the right. Go forward and turn left to examine the display bearing the images of various god and goddesses. Take careful note of the little statues and their various duties in caring for the ancient Egyptian population. The door at the end of the room is also locked. Pan right of that door and examine the stone hieroglyph. The camera will move to the side door, but look back and pick up the fourth SEAL down and right on the floor. The side door is also locked. Turn right. Go down the side of the room, past the central open sarcophagus bearing the mummy and click on the second from the left statue along the wall. The statue will move aside, revealing a locked compartment. Makes you wish for a ring full of skeleton keys! However, in this case the crafty Sherlock remarks that it appears this lock might be broken. Use your screwdriver to break the padlock. Open the compartment and extract a silver KEY. You will lose the screwdriver, (as you will other items) but don't be concerned. You'll never need it again and its just one less thing to pack around. Go back to the left and use your oil flask on the side wall set of locked doors. Then use the silver key you just found beneath the statue. The doors are "unlocked." Open the doors. Hmmm, looks like this room has never been converted to a display area. Maybe its been used for storage and for unpacking exhibits as they arrive at the museum. Walk directly across the room and have a look in the big mirror. Yippeeee ki yo, its a scary mummy! He obviously isn't thrilled about your being here, but he doesn't appear to want to actually take your life. At least, not yet. Go to the right and take a good look at those boxes on the floor. It appears that one of them might possibly be opened. Use your hammer from inventory to whack the box a good one and extract BIG, MIDDLE, and LITTLE GEAR WHEELS and a fifth SEAL. Be sure to click on the box again to add some WOOD to your inventory. Go on past the boxes to the end of the room. Look at the large cupboard against the end wall. Use the gold tie pin from your inventory to unlock the doors. Remove the BOTTLE OF WHISKEY. Leave the room. Turn left and go forward through the adjacent two rooms and down to the end of the third, where there is a double door on the end and another on your left. You've been here before, remember? Turn left at the end of the room the view the door displaying four seals. Open that door. Looks like you're inside Lord Montcalfe's study. Walk forward once and pick up the PAPERS from the desk. Also, read the "A Strange Philanthropist" article clipped from the newspaper, about Lord Montcalfe's aspirations to present the mummy of the priest of Khaepaseth. From the desk, go back left to the other desk near the room's end wall. Pick up the MATCHES and look at the open document which appears to have some pages missing. Use the matches on the candlestick at the lower left corner of the desk. Look up at the wall ahead of you and go forward once. Turn left and open the fire box on the wood heater. Put the papers inside, you just collected from the first desk. Use the bottle of whiskey on the papers inside the fire box. Next, use the wood from the broken. Turn right to the strange, mechanical door security device on the wall. Insert the big, middle and little gear wheels from inventory into the appropriate places. Turn back to the open stove door and use your matches to ignite the material you placed in the heater's fire box. In a cutscene, the locked doors will open and you, Sherlock, will be finally allowed to enter Montcalfe's obviously prestigious library. With your back to the double doors, turn right and pick up the bright blue HISTORY BOOK from behind the white pillar. Go up the spiral stairs behind you in the left corner of the room. Go left and forward to the bookcase with bright blue books. While holding the blue book you found behind the pillar, click on the book on the second row, right side. The bright blue History book will properly store itself and you'll have a bright green RELIGION BOOK in your inventory. Aha, so that's how it works. Let's repeat this exercise a few more times, tidy up the library, and maybe find a clue or two to Montcalfe's disappearance along the way. Find the bookcase with bright green books. Exchange the green book while picking up a bright red GEOGRAPHY BOOK. Go back down the spiral stairs and over to the far left corner of the room (from the stairs) where you'll see the bright red books. Replace the light blue PHILOSOPHY BOOK with the red book. Sherlock just may be a victim of obsessive compulsive disorder, don't you think? Or maybe he missed a greater calling as a librarian? Now, holding the Philosophy book go to the other end of the room in the right corner opposite the spiral stairs. On the second shelf of the bookcase, with the blue books, exchange the one you are carrying for the black LAW BOOK. Take the black law book back up the stairs till you're facing the bookcase with all black books. Exchange the one you have with the yellow SCIENCE BOOK on the right side of the second shelf. Now, go back down the stairs. Go slightly right and forward to the yellow books. Exchange the yellow book with the white PHILOSOPHY BOOK on the left side, second shelf. Exchange this philosophy book with another large white (may look blue) book in the third shelf, right in the middle. Its within this philosophy book that Sherlock finally finds what he didn't know he was looking for.....another KEY! Go to the large table and examine the papers and the news article, then go back up the spiral stairs and use that newly won key to open the locked door along the gallery. Turn back and enter the green draped door ahead of you. You'll be facing a set of double wooden doors. Turn left and walk to the corner to examine the empty sarcophagus. Sherlock remarks that it looks like Momphis XI seems to have gone for a stroll. Now how likely is that? Note the sand. When you back out of the picture, look right to examine the wall mounted rifle, then go forward, turn right and click on the lavender colored draperies to reveal another door. Let's continue our examination of this room first, however. Look down in front of the sofa and pick up the note from Elizabeth. She didn't tell you she'd studied archeology did she? Wonder why she wouldn't mention that? Turn left and walk toward the fireplace. Examine the mounted lion's head over the mantle. A hunting trophy, no doubt. Continue left and look at the large corner cabinet. You'll find that you are, as yet, unable to force it open. Turn left. Walk to the opposite wall and look down in the dark, open cupboard to pick up the PIPE CLEANER. Look up and click on any one of the displayed pipes to hear that Sherlock and Lord Montcalfe have a love of ornate pipes in common. Nothing else to do here. Look up and click on the picture of Lord Montcafe. Sherlock muses that it is strange that none of his archeological finds can be viewed down on the ground floor. When you back out of the picture, look at the large wall framed family tree, which it appears, Lord Montcalfe has vandalized with some particularly virulent comments. Take particular note of Sherlock's remarks about Jonathan Parkey ("thief, murderer.)" Turn left immediately. Look down and pick up the FAKE REGISTER from the floor near the fallen book. Look at it to begin considering that there may have been some illegal manipulation of the archeological inventory Montcalfe collected. You think? Pan up and left to check out a locked panel. No luck opening it for the time being. Continue right to the picture over the fireplace. You will see a forward hand cursor, but no action is yet available with your current inventory. You'll be back. Examine the fire in the fireplace. That's strange. A cheery, newly made fire in a deserted mansion? Continue around the room and click on the bay window to see a mysterious cutscene. Now, who might that be sulking across the roof tops? Examine the spy glass on the tripod. Turn around to the desk and pick up and read the resignation letter from Edward, the butler. The letter announces the resignations of the entire mansion staff, but does not provide a reason. Walk to the wall bookcase next to the desk and see the other side of the little door you may have come across and couldn't open from the library gallery. (Don't click on it unless you want to reenter the library and make you way around to where you are standing now. You can't get back into the upper study from the gallery side.) As you go around the room and back to the door, note that the chalk board, left of the door, has been erased. Perhaps some formula or plan that Montcalfe wished to keep secret? Or maybe the lurker on the roof tiles had something to do with this. Clearly, someone has been in the study and most recently. Leave the room. Turn left and go forward once. Turn right and reenter the parlor room where you found the pipe cleaner. Go right to the lavender draped doorway. Use the fake register at the bottom of the door. Leave the room and go down the hall to enter the far door on the right. Its the bathroom. Pick up the BAR OF SOAP from the sink. Before you leave, check out the bathtub. Hmmm, the water is still warm? Who just bathed? And, who would be fool enough to leave the water in the tub? Unless, of course, you interrupted the ritual before the bather had a chance to erase the evidence. Creepy business in any case. Pull the plug and watch the water drain out of the tub. Click on the bottom of the tub....there's a residue of sand there. Let's see, sand here and sand in the mummy case. The mummy had trouble resting in peace because he had sand in his drawers? You think? Enough conjecture...leave the room and go back to the parlor. Go to the lavender draped door and use the bar of soap on the lock, put the fake register back under the door (if its not still there). Use the pipe cleaner on the lock. Voila! A cut scene reveals the trick to getting another KEY. Use the key to open the door and enter Montcalfe's bedroom. The Egyptian decorative theme is everywhere. Walk to the left around the bedroom. Find Montcalfe's pith helmet on a side table. Go forward to view the bedside table with puzzle piece obviously missing from the parquet arrangement at the top. The drawer is locked. It doesn't take much to figure out that you'll need to solve the puzzle before you can open the drawer. Continue around the bed and walk up the along the opposite wall to the wardrobe in the corner. Open the right side door. Click on the shirt to find some powder that might be useful as an aging agent in designing a disguise. But, who would be disguising themselves? There's surely no indication that any of the mansion/museum's sometime occupants ever performed in the theater. Exit the close up and go left to leave the room by the side door, which takes you back to the hallway. We need to find those puzzle pieces so we can open that nightstand drawer in Montcalfe's bedroom. Go down the hall toward the statue one time. Stop and look down and to the right across from the study door. You should see a fork sticking out from the edge of the carpet runner. Pick up that FORK. Go back into the study and use the fork on the picture over the fireplace. Sherlock will make a comment about a crack in the painting and you'll see a dark hole low in the center of the painting. Use the fork in close up, from your inventory, to find the hole and pry the painting open, revealing a hidden compartment. There are a lot of hidden panels, rooms, compartments in the the museum...as you are discovering. Find the REAL REGISTER of Montcalfe's Egyptian collection. If you take the time to compare the "real" with the "fake," you will find some captivating discrepancies you might wish to mull over. Pick up the CANE from the compartment. Look in the drawer again and find a letter to Montcalfe from Dr. Bigoudin advising him about the content of a scroll found near Momphis XI's sarcophagus. A curse? What would a mummy story be without a curse! Be sure to click on the arrows to see the note on the reverse side. Cross to the center of the room and look up at the fan. You should get a magnifying glass cursor here, if you are standing in the right spot. If not, circle the fan until you see a small white button above the fan blades on the shaft. Click on it to hear Sherlock express the need for "something long." You don't have the cane anymore, but what you need is right here in this room. Remember the document you just found in the drawer? Take the GOLD AND GREEN SCEPTER. Also, that breaking glass noise you heard when you turned on the overhead fan might be worth investigating. Go over to the right corner of the room and find a smashed urn. Pick up a GOLDEN SCARAB beetle from the floor. Leave the room by the double side door and go right, forward and then left down the hall and back to the messy study. Remember that panel on the top of the desk with the white chalky rings on it? You may or may not have checked it out earlier. Its on the left side of the desk as you walk in the study door. Click to go over there and then click on the panel to reveal a hidden mechanism. You "need something to open it." Use the golden scarab beetle from the bedroom on the bottom left wheel to turn them both. Then click on the t-bar handle to move the panel aside. Inside this compartment, find a note from the "Dawn of the Gods" association regarding the funding of Montcalfe's Egypt expedition. Find a second note proclaiming that Montcalfe had kept some items he was supposed to turn over to the association. Uh oh....deviousness is apparently possible on Montcalfe's part. Did he steal some of the mummy's treasures? Might that account for the possible curse and the mummy's apparent refusal to rest in peace? Click on the last item in the compartment to learn that the clever Sherlock wants nothing to do with a weapon with which he is not familiar. Turn around and walk over to the hall door. Look at the little cupboard on the wall to the right. Remember you couldn't do anything tangible with this apparatus earlier, but this time you can click on it to discover, oh gad.....a dreaded slider puzzle. Solve the slider. Yes, I mean on your own. :) Its not hard at all, maybe five minutes and I'm no genius! Its takes less time to solve than it would be worth it to me to lay out all the steps here, which I started to do and almost immediately abandoned. When you've solved the slider, you'll find another KEY. Take the key back to the parlor (where the lion head is) and use the key on the large cabinet standing left of the fireplace in the corner of the room. Remove the fake SCEPTER from the cabinet. Return to the hallway and turn slowly to rest your eyes on the "fake statue" at the end of the hallway. You've got a couple of scepters now in your inventory that might look quite charming as an addition to that statue. Use them both now! Wow! I know you were really glad to put that last level behind you. On we go! Sherlock finds himself at the bottom of a long stairwell in a small, dark, wine cellar. With your back to the door go left along the wall to the stoned-in doorway at the end of the room. Turn left to the littered table top and remove the box of MATCHES from the upper left corner. Examine the remnants on the dinner plate to hear Sherlock exclaim, "Someone had dinner here a few hours ago." Take the WATER FLASK to the right of the dinner plate. Swing to the left and pick up the sleeping cot to see a trap door beneath it. Sherlock remarks, "Someone has been sleeping here." Maybe the mummy? Naw. Click on the trap door. No surprise, you'll need something to open it. Turn to your left and go along between the wine casks to the opposite wall. Look down left and pick up a HAMMER. Turn around and walk down the wall to the wine storage racks. Turn left and remove a BOTTLE OF LIQUEUR and a hidden GIN BOTTLE. Click on the now empty shelf to hear the, "bottom seems to be made to fit circular objects." Like the bottom of a wine bottle maybe... well duh! But, wait....this will mean more to you later. Turn right and go forward twice more. Turn around. Find the BOTTLE OF BORDEAUX on the top right shelf. Scan the additional wine shelves on the end wall to find a BOTTLE OF TOURAINE in the left corner, five shelves up. Also find a BOTTLE OF BOURGOGNE in the middle, four shelves up. Continue forward and pick up a BOTTLE OF SPAIN WINE from the end stack of shelving, second shelf up. Pick up a STICK from the shelf next to it on the left. Okay, ready to go on? Combine each of the two rags with a stick in your inventory screen to make a TORCH. Use the gin bottle on the rag tips of each torch. Use the matches on one torch. It will light. If you need the other torch later, you will be able to use it then. Take the bottle of Bordeaux from your inventory and place it in the now empty shelf on the end of the side rack of wine shelves, where you found the liqueur and the gin bottle. Place the bottle of Bourgogne next to the bottle of Bordeaux. Place the bottle of Touraine next to the bottle of Bourgogne. Place the bottle of Spain wine next to the bottle of Touraine. Place the bottle of liqueur in the last open position, to reveal a descending shelf and an ascending slider puzzle. Oh no! Not again! Exit the puzzle immediately and save your game ...this slider is timed. But don't panic, you'll have plenty of time. Again this "five minute" slider is quite easily solved (so the solution is not published here) and the timer in the sequence extends for a considerable period. The slider puzzle is only the first in a series of prolonged conundrums. When you have solved the slider, the puzzle will shift away revealing a large silver button. Push it. You will hear a click from somewhere in the room. Turn left, go forward once and face the wall. Click on it to enter another room. By its appearance its an old laboratory. Go along the left wall to the large glass fronted cabinet and find "The Book of Sacred Magic." Lord Montcalfe appears to have been really interested in mysticism; raising the dead maybe? Go to the desk on the end wall and find a letter from Montcalfe about his nightmares and supposed hauntings. Find another note which mentions he's seen the distrusted Jonathan Parkey in the mansion. There's a surprise prepared for Parkey (better watch your step too, Sherlock). Read other notes about Egyptian legends and the danger of disturbing dead pharaohs, and a last note on the end of the table (right), about actually seeing the dreaded stalking mummy. Lord Montcalfe has begun to take the medication laudanum for his nerves. Be sure to read the note at upper left on the table too, about not overdosing on laudanum. Zero in on the purple/blue book lastly, to read page 169. "We note that most of civilization distinguished primary elements such as fire, water, air....etc. All the notes, are as earlier stated, safely stored in your journal. Turn slightly right and click on the chair. Swing left and place it on the end of the desk against the wall. Its blocking your ability to open the drawer in the desk. Click on the drawer, though, to learn that you also need no less than 2 keys to open it. Turn around and walk over to the left side of the room where you see a littered workbench. Click on the green book with a page 11 about the cast system in India. Also see the note regarding an article by Lord Montcalfe about reincarnation. Read the note beside the book about arranging the "treasure room." Learn about Montcalfe's impression that the "Dawn of Gods" association and his desire to find the stolen Anubis statue. This, in order to stop the supposed spell triggered by the disappearance of the mummy and other precious articles from the Egyptian dig. Montcalfe does not want Jonathan to inherit his secret treasures. Again, there's a warning about a "surprise" waiting for Jonathan. Don't forget to save your game often (here noting again that there are only six save game slots). Note the laudanum above the green book. "at the same time or you will be dead"
Pan down to the floor and find the pointing cursor to direct you under the center table on the right side. Pick up the OIL FLASK. Go back to the desk and find the pointing cursor on the left of the desk above the chair you placed there earlier. Take a third KEY from the niche in the wall. Get down from there and turn right to the door. Use the oil flask on the lock to loosen it. Its rusted after all this time in a damp cellar. Use one of the three keys from your inventory to unlock the door. WOW! That was some test of time, huh? Note: You might want to continue saving your game, as the "enigma" is not over and you are still being timed. By this time, you are almost surely using the second torch from your inventory. Before you start investigating this room, though, you have some unfinished business with that desk on the end wall in the laboratory. Turn around and go back to the desk. Save your game... "or you'll be dead." The scroll from the center table will assist you with the solution to the drawer puzzle. Now that you have both necessary keys, you are able to get a new closer look at that drawer in the desk. Insert your remaining two keys in the appropriate keyholes. The key with the symbol that looks like a G goes in the right side keyhole. The key with the sort of half-moon symbol goes in the left keyhole. Push the outer turn arrow on each lock once. Then press the "turn" indicator. The drawer will open and, in a cutscene, Sherlock will extract another "nice" statue. Whew, you didn't get blown up......yet! Go back to the storage room you opened a few minutes earlier and go to the back of the room where you can see a pinpoint of light. Pick up the OIL FLASK. In the back left corner of the room, on a bottom shelf, you will find a small white BOTTLE OF OIL. In inventory, combine it with the oil flask. - find the first urn bearing a volute, a spiral design, which stands for air. Put the empty bottle in that urn. - find the urn marked with a triangle, which stands for earth. Put the pouch of sand inside. - find the urn inscribed with a fire symbol and put the matches in that one. - find the urn with a drop of water and put the water flask in it. You should hear something happening over near the entry door, when you have correctly solved this puzzle. Go back to the left side of the door to find a new timed puzzle has appeared on the wall. Save your game before you click on the puzzle. The last will be the first." Remember the phrase from the riddle? The last will be the first. Reverse the order of the other three name to S, V, K and then attempt to place the last letter B in the remaining position on the puzzle board. Before you can pick up and place the B, however, you will see a cut scene of one of the floor urns moving aside. Turn right and return to the back left corner of the room to the urn located there. Look down and pick up a third Anubis STATUE from the recess in the floor. Sherlock remarks that maybe you will find more statues. Remember that there are five of these hidden about the mansion/museum. Look in your inventory to see that you still have the Brahman symbol from the wall puzzle. Leave the storage room. Go straight across the lab to the opposite door, previously locked. Open it to hear Sherlock comment that he is close to solving the mystery. Practice moving about the room with your cursor. In order to accomplish this and to reach the statues, you'll generally need to go forward to the center and then turn in the direction you wish to go. You want to reach all four statues. That's the bottom line. When you have done this you will hear a click that indicates the opening of a panel in the floor over near the door where you came in. Pick up a fourth Anubis statue in the niche you will see there. Be sure to check out the riddle on the door to the right and rear of the room. Read the riddle, in close up. Leave the rotating room and go back across the lab to the storage room. Use the "B" Brahman seal from your inventory on the center urn standing on the floor. The seal will disappear into the urn and Sherlock will comment that Brahman may be the key to the mystery. Brahman means "truth." If you eat it, you die. This riddle may have lost a bit in the translation to English, but the answer is "truth" (Brahman) or "nothing." Nothing makes a lot more sense in the context of the riddle. You've already sequestered the Brahman seal, so back out of the close up and click on the door latch to open it. Off to your right you'll find a large half cask filled with water. And, to the left of it, a crude scale that looks like a black stool. Click on it to hear Sherlock proclaim that its a "balance." the charter here is to put four liters of water on that scale. Take the little bucket. Fill it with water. Pour it in the big bucket. Click on the vials at the left side of your screen to put the little bucket down. You should now have 1 liter of water in the small vial (bucket) and 6 liters in the big vial (bucket). Pick up the big bucket and dump its contents on the floor; dark spot between the half cask and the scale. Put the big bucket down. Pick up the small bucket and dump the 1 liter into the big bucket (watch the vials). Then, fill the little bucket once and put it in the big bucket. You should have exactly 4 liters! Success, you clever sleuth! Put the little bucket down. Pick up the big bucket and put it on the scale. In a cutscene a Chess board will immerge from an alcove in the center of the dirt floor. Oh joy! A dreaded Chess puzzle. This one is no biggie, Sherlock. Honest. Just place the four Anubis statues from your inventory on the four corners of the Chess board. In a cutscene, a rectangle of stone (a pedestal) will rise from the center of the Chess board. In the cutscene Jonathan Parkey, Montcalfe's claimed enemy, will come through the door with the missing fifth statue in one hand and a very large gun in the other. He intends to show the way to the Treasure Room; the inner sanctuary. Ah, but our old friend Mr. Mummy has a big surprise for Jonathan. You see the mummy pull a lever in a cutscene and, as Parkey attempts to open the entrance to the treasure room, he is blown to pieces through a mysterious orifice that appears in the door. 1. Swing around and pick up both buckets over near the half cask of water. 2. Look down to see a busy scorpion. 3. Quickly take a bucket from your inventory and cover the scorpion. 4. Move to the door. 5. Turn around and click behind the Chess puzzle (what's left of it). 6. Look down when you arrive there and put the second bucket on the new scorpion. 7. Pick up the WOODEN PLANK. 8. Look down and pick up Parkey's BAG with the fifth Anubis statue safely tucked inside. Go back through the door to the destroyed rotating room. You probably observed Parkey's dismembered body on the floor near the door, but don't take the time away from solving the puzzle and getting out of there. Note: If you have trouble solving the scorpion puzzle, try reversing the order of the buckets you use. Use the big one on the first scorpion and the little one on the second, or vice versa. Look out as you enter the rotating room here. You just might take a nasty fall. Turn right and look down. Use the wooden plank to create a thin bridge to the corner statue. Go to the statue and pick up the MIDDLE GEAR WHEEL at the statue's feet. Turn left and take the CHAIN. Go back to your starting position in front of the door you came in through, and walk out to the center of the axle of the wheel mechanism that turned the rotating room. Remember that interesting ring in the ceiling? Use the chain on it now. Pan down and left to see a niche in the wall beside the exit door. Click on it to see a cutscene where Sherlock swings his merry way through the niche and into the now destroyed wine cellar. Sterling move, Sherlock! 1. Press the first stone on the bottom on the right side. 2. Starting with the next stone up, count 1, 2, 3 and click on the third stone. 3. Traveling up; count 1, 2, 3 and click on the stone just under the right corner stone. 4. Count 1, 2, across the top from right to left, press the third stone just right of the "3" stone. 5. Count 1 on the "3" stone, 2, 3 and press the stone to the right of the left corner stone. 6. Count 1 on the cornerstone, then 2, 3 going down the left side and press the third stone down from the corner. 7. Count 1, 2, 3 continuing down the left side, and press the second stone from the bottom. Hallelujah!!!! It seems you now "can go through the door." Wow! Was that an explosion or what? The sad results of the blast seem to be evident everywhere! Its even still smokin' here in the reception hall. You can take your time if you enjoy picking through debris, but I'd suggest making a bee-line for the area beside the (left side) staircase, straight ahead. You'll find a note in the lounge area there that encourages you to go upstairs. That is, if you aren't afraid of the lurking mummy. On the coffee table, you'll discover someone ( the mummy of Montcalfe?) was writing a note and its been partially burned. To the left of the lounge area in the corner, there's a mirrored cabinet. If you click on the mirror, Sherlock will remark that there's something behind it. Also, you need "something thin." Store that in your memory banks for a moment and move on to the other side of the hall. use your lantern on the remaining lighted candle on the chandelier and place the LIGHTED LANTERN in your inventory. Look down just in front of the stairs to see more sand and some gray hair. More mummy discards, no doubt. Go up the stairs to the first landing. Look on the next up riser and find a HAIR PIN. Sherlock will comment something to the effect that " this woman's trinket" wasn't there the first time he went up the stairs. Elisabeth's trinket perhaps? Something more to mull over concerning the probability of an unseen populous roaming about the mansion. Why would Elisabeth be in the mansion without announcing herself? Ahem, oh well.........time to press on, Sherlock. Turn around and go back down to the mirrored cabinet in the corner. Use the hair pin. you'll find an "absolutely dreadful document" ..... DIRTY PAPER. Go back over to the chandelier and hold the dirty paper up in front of the burning candle to see a map or chart. After you've examined it, it will be held in your letters folder, so no need to copy it. Each lever has three positions: down, middle, and up. There's a dark red light above each lever's slot. When you solve this puzzle, the lights will be dimly green. (Hard to see, so watch for the change.) Don't back out of the close up while you are working on the puzzle as it will reset. Exit the closeup and go up the stairs to the second floor. Turn left and continue around to the only set of doors on that side on the mezzanine. Click to enter the hallway behind a brick wall. You are back behind the library, Montcalfe's private quarters, under entirely different circumstances. There are two rows of ankh symbols underneath, with a set of three and two sets of four in the first row. There is one set of two and two sets of three in the second row. Once you've viewed the message, consider that the placement and grouping of the letters may be more significant than the letters themselves. The "HOOKS" you hear Sherlock mention, will go into your inventory. Okay, let's go on. Turn back to the left going down along the hallway and immediately click on the painting leaning against the wall on the left; a dark landscape. Click for a message "EGYPT WILL HELP YOU." Proceed down the hall and look down right to click on the fallen wall panel to learn all this damage may not have been caused by the explosion that killed Jonathan Parkey. Another puzzlement. Find a glass on the carpet that has been smashed by something "very narrow.....like a woman's shoe." Further indication that perhaps Elisabeth is meandering about the mansion in all this devastation. Sherlock is one impressive detective isn't he? How could he possibly know what smashed that glass? ESP? What do all these hidden messages mean? In any case, once you've viewed this one it will also pop into your letter folder with the others. Swing to your left and enter the smoky parlor. You might have to go out and take a deep breath here a few times. In fact, I'd highly recommend it. Go to the right side curtains by the single door to the bedroom. Use your broken bottle to cut a piece of curtain to mask your breathing somewhat against the smoke. Now who'd have thought that's what you'd be using that broken bottle for! Leave the room and get some air. Go back in and go to the shield on the wall above the sofa. Click to swing it open it and reveal a word puzzle. Use the messages from the hallway to solve it on your own if you like. Click out of the closeup and click back on the now open window in the wall. See that "X" next to the tilted family tree picture behind you? Pick up a SPEAR HEAD on the floor near the lion's head on your way over to X marks the spot. Use the spear head there. From the alcove, pick up THREE WEIGHTS, a SMALL KEY and a LETTER from Montcalfe to Elisabeth stating his sorrow at having failed to save the world from the curse of the mummy he's loosed upon humanity. Sounds like the laudanum is talking here. Now that you are back out in the hallway (I hope you are) catching your breath, proceed down the hall to the middle door on the right side. Click on the clock device on the right side of the door and attach the three hooks at the extreme bottom of each weight. Then, place the middle gear wheel behind the center bracket of the clock. Place the three weights on the bottom hooks left to right, as follows: Gold, then Blue, then Silver. The clock face will open. Click the gold key in the face of the clock to wind it. "THERE'S A BOMB IN THE BUILDING!" and you are just about to detonate the darn thing............... Cross the room to the little door that leads back to the library. Put the bag of gun powder on the door handle and then place the lantern beneath it. Sherlock will ignite the powder in a cutscene. The door will blow open loudly and you'll be up on the gallery, an action which culminates in the long anticipated meeting with Lord Montcalfe. After a short and panicky scene where Montacalfe warns about the pending bomb explosion, which will undoubtedly destroy the mansion, and everyone in it, you are ready to begin the last level of the game. Do not touch the gallery railings! Walk around to the opposite end of the gallery and turn around to see a large blue book on the shelf. Click on it. In a cutscene the shelving will move aside to reveal an antiquated Faraday machine which is producing the electricity for the railings. Pick up the SHOVEL from the left, beside the open doors of the machine. Use the shovel to scoop the hot coals out of the fire box. Then pull the lever on the right side of the round boiler mechanism above. The machine has been deactivated, so the hand railings are now safe to the touch. Go back around to the full door that leads back to the hallway. Look down and pick up the old rifle. Examine it to find the mummy who's trying to blow up the museum, along with your very own self, Montcalfe and whomever else might be lurking about, apparently has "skin on his fingers." Aha, just as you thought. This mummy isn't quite dead after all. Go down the spiral stairs and left to pick up the ladder standing nearby. Take it to the shelf with red books in the opposite corner of the library. Set it against the shelves and climb it to find a receipt for explosive materials and a dynamite user's guide. And, to the right a DROPLET PIPETTE. Leave the room by the double doors and return to the bottom floor study. Take the CANDLE from the candlestick on the desk to the right. You can walk around the toppled furniture to find another puzzle on the same wall (to the left) where you came in. You will have to leave this room and examine the adjacent rooms, picking up several more items and the additional tiles or squares you need to solve the puzzle. Leave the room and enter the first exhibit room. Go across the room and look down in front of the shattered mummy case to find a trap door with some kind of mechanical device. Remember where it is. Go across the room to the tall display cabinet. Pick up that familiar sacrificial KNIFE from the bottom shelf. Go forward, turn left and move the blue urn. Get the BATCHER hidden inside. Turn around and enter the next exhibit room through the double doors on the end wall. Find the broken case in the middle of the room with drawers. Use the knife to open a drawer and get the BLACK SQUARES and the WHITE SQUARES. Note that the mummy has disappeared from the case in the center of the room. Just past it, on the floor, pick up an AXE. Go into the next room (pale blue walls) and go along the left side to pick up (using your knife) two small CONTAINERS and a gray CUP which looks like a salad bowl. Proceed to the end of the room where the god and goddess statues were kept in the glass case. Some of them have fallen to the floor. Find an odd LAMP in front of the cabinet. Go to the room where the mummy was (center room) and find a small OIL FLASK to the right of the side door to the reception hall, where the chandelier is blocking it. Go back (left from front hall door) out to the next room and down the right wall to the orange cabinet in the far right corner. Use your knife to open it and find MORE SQUARES. That should do up the preparations to take on that daunting looking puzzle in the ground floor study. Turn around. Go down to the other end and out the left side door back to the study. Approach the Japanese tile (Gridder/Conceptis/Nonogram) puzzle in the wall niche. If you have everything you need, Sherlock will say, "Let's do it!" The squares will magically appear under the puzzle in two "containers." Each contains colored squares for completing the puzzle. Note: If you are totally exhausted just thinking about all this and are now in the last throes of anguish before you start forcibly removing your hair, or worst yet, you are beginning to show signs of criminal behavior.....THERE IS A BYPASS FOR THIS PUZZLE. After the puzzle is solved (by some combination of genius and magic) you will be able to pick up a large LEVER from the puzzle alcove. Take the lever back to the first exhibit room just outside the study door. Use the lever on the mechanism in the floor that you found there, under the carpet runner (in front of the mummy case in the middle of the left wall). Use the lever on the mechanism to move aside (in a cutscene) a sarcophagus in the farthest (third) room from the study. When you click on the machinery under the sarcophagus, Sherlock will let you know you need more light. Turn around around and go back to the first exhibit room off the study. Go to the glass encased sarcophagus on the right wall. In inventory combine the oil flask with the ancient lamp. Then use the lamp on the wall mounted gas lamp above the sarcophagus. Go back through the other two rooms and click the now light lamp on the open sarcophagus. You'll find yourself back in the storage room. With the ladder you just descended at your back, go to the far left corner fo the room and pick up a ROPE dangling from the shelf in the left corner of the storage room. It doesn't look much like it did on your prior visit, but you'll remember its where you dropped several items in the standing urns. Go to the far end of the long table against the wall and pick up a wooden BOX. Take it across the room and into the alcove that the explosion has exposed behind the fallen display case. Yikes, its THE bomb! Save your game! 1. Put the box you just found on top of the big box you see in the corner. 2. Put the batcher/scale on the small box. 4. Place the pipette above the center of the batcher. 5. Put the candle on the right side of the batcher. 6. Combine the axe with the rope in inventory. 7. Put this combined apparatus on the hook on the wall up to your right. 8. Light the candle with your lamp from inventory, and step out of the room for safety. You will see the candle burn the rope in two, the axe drop and sever the steam pipe, and the dynamite bomb will be forever silenced. HOORAY! You've won and have saved your own hide as well as to have captured the culprits. The ending movie reveals the appearance of the vacationing Watson, along with sufficient numbers of local law enforcement. 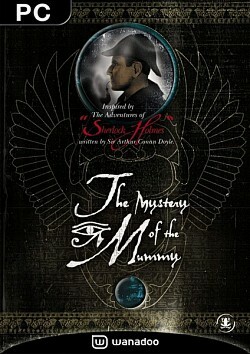 In the company of the guilty, Sherlock unwinds, in a lengthy narrative, the mystery of the mummy. permission of the author, Witchen, at GJan1@aol.com or webmaster@gameboomers.com. Questions or comments regarding the content of the walkthrough may be sent to GJan1@aol.com.The content may not be altered in any way and all reference/links must be provided to this site: GameBoomers.